It might be true in the words of Kohelet that there is nothing new under the sun. I had been enamored of Dorothea Brooke’s declaration to Mrs. Cadwallader that “I never called everything by the same name that all the people about me did.” I was thinking that the role of the teacher might be to not call things by the same names as did others, and I worked happily thinking I had formed a new idea that were it to be heeded might transform education! How interesting, I thought. So original, I thought. And then I read that in 1902 John Dewey had written “Solution comes only by getting away from the meaning of terms that is already fixed upon and coming to see the conditions from another point of view, and hence in a fresh light.” Dewey was advocating not to call things by the same names as others. But perhaps he had gotten the idea from George Eliot. And certainly, the idea preceded Dewey’s declaration in The Child and Society. In his belief in and quest for the unified theory, Einstein said that God did not play dice with the universe. I think that Einstein was suggesting that there is order to the universe and that occurrences happened not by chance but by design. If I remember, Einstein was responding to the advent of quantum mechanics. And in his essay, “Compensation,” Ralph Waldo Emerson wrote, “The dice of God are always loaded . . .” Emerson declared that God knew exactly what God was about: if God played with loaded dice then God always knew what the outcome of the game would be. In his song, “Anthem” Leonard Cohen declares, “There is a crack, a crack in everything/That’s how the light gets in.” For Cohen the world’s flaws become virtues. And in the essay, “Compensation,” Emerson writes “There is a crack in everything God has made.” Emerson suggests that perfection does not exist, and that everything has its price that must be paid. If everything in Nature comes at a cost, then every engagement in our lives requires some form of compensation. There is Walter Benjamin’s “Thesis on the Philosophy of History.” In the essay Benjamin writes that the face of the Angel of History is turned toward the past. Where we see in that past a series of events, the angel sees only one huge catastrophe. The Angel would like to stay and to make whole what has been smashed, but a storm blows from Paradise propelling the Angel into the future even as the pile of detritus continues to grow skyward. That storm, Benjamin says, is Progress! But progress is an illusion: the angel’s face is turned toward the past which cannot be repaired even as the storm from Paradise blows him into the Future though his gaze remains fixed on the past. And Emerson again: in “Compensation,” writes of the human condition in a prose that is, I think, weighted heavy with irony, “We do not believe there is any force in to-day to rival or recreate that beautiful yesterday . . . We cannot stay amid the ruins. Neither will we rely on the new. And so we walk ever with reverted eyes like those monsters who look backwards . . .” We move forward blindly into a future we would not see even as we romanticize the held beauty of the past. Finally, in Camus’ The Plague Father Paneloux acknowledges that regardless of how anyone conceptualizes the existence of the plague, what is essential is that each “must be the one who stays.” The plague must be met with resistance and we define ourselves by our struggle with the pandemic. What is the plague but life and life only! And in his essay “Fate,” Emerson wrote, “Go face the fire at sea, or the cholera in your friend’s house, or the burglar in your own, or what danger lies in the way of duty.” Emerson urges us to be the one who enters life fully and stays engaged. Thoreau, too, argued that “However mean your life is, meet it and live it; do not shun it and call it hard names.” Be the one who stays! The shooting this week at the baseball field occupied by some Republican congressmen and aides seems to me ironic since it is the Republicans who advocate for looser gun control. What was that man doing with a gun in the first place? Indeed, Steve Scalisi—who infamously spoke to a convention of sorts of white supremacists and neo-Nazis—has been an ardent supporter of the NRA and for a relaxation of gun control regulations. Hoisted by his own petard, methinks. I have a suggestion for the Republican fools. As long as we are advocating looser gun control in order to . . . well, this is what really puzzles me, because Scalise would have been shot anyway and the shooter was killed by the police who lawfully carry guns! What would carrying guns have prevented in this instance? Chris Collins, a Republican representative from New York, blamed the shooting on the Democrats . . . and declares that he intends to carry a gun into the House chambers from here on. This should call up short the Democratic opposition. But here is my opening recommendation: I think a handgun should be placed under each base in the infield, and under the chest protector and beside the bag of balls with the umpire behind home plate. The right-fielder (well, we know who gets to play right field) should also be armed, and so perhaps, should be the first and third base coaches. I mean, all they do is wave one of their arms at a time leaving the other hand free to draw and shoot! Trump has pulled out of the Paris Climate Accords and has begun a process whereby hundreds of thousand women will be denied insurance coverage of means of birth control. According to James Comey Trump has attempted to subvert significant investigations into allegations of corruption and foreign intervention in our democratic process and then lied about his actions. He is a danger to the Republic for which he stands. All this (and repulsively more) passes with the sanction of the Republican Congressional majority. Indeed, Paul Ryan recently attributed Trump’s ineptitudes to his inexperience. Well then, perhaps he shouldn’t have declared himself ready to be President, nor should the Republican majority continue stupidly to follow along with his arrogant stupidity aware as they must be that they are aligning themselves with forces governed by blind ignorance and egotistical hubris. 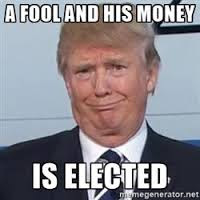 At the moment, the government (and country) seems to be controlled by a lying, amateurish, greedy Fool and his lapdog-Congress whose missteps and ignorances endanger our well-being and even our very existence. There was a time when I employed the adjective ‘craven’ to describe the gang of Republicans, and perhaps there remains not a little truth that attaches to this description. But the more I watch the papers and (with trepidation and regret) look at social media, I want to add to their actions the adjectives ‘vindictive’ and ‘venal.’ The Republicans own the government and damn it, they will without conscience steam ahead doing whatever they pleased, overturning the entire social structure that has been built over the past seventy years—and that came to define the social structure of the United States most often against the wishes of the ultra-conservative evangelical right of the party. Often it seems to me that they awaken gleefully in the morning, rub their hands together and cackle: “What evil can we indulge in today? Whose lives can we make more difficult? Hee, hee, hee!). But I wonder how much energy can one spend on such abject stupidity? What more can be said?